Revo Property Pay is made exclusively for the property management industry. There are no fees for payment processing for the property manager or tenant. The Web-based platform can be used on any smartphone or tablet without needing to download an application. Having the ability to pay bills and manage transactions through multiple platforms is a necessity for many of us, so the increasing availability of mobile payment providers is helping to take the stress off individuals on either side of the transaction. 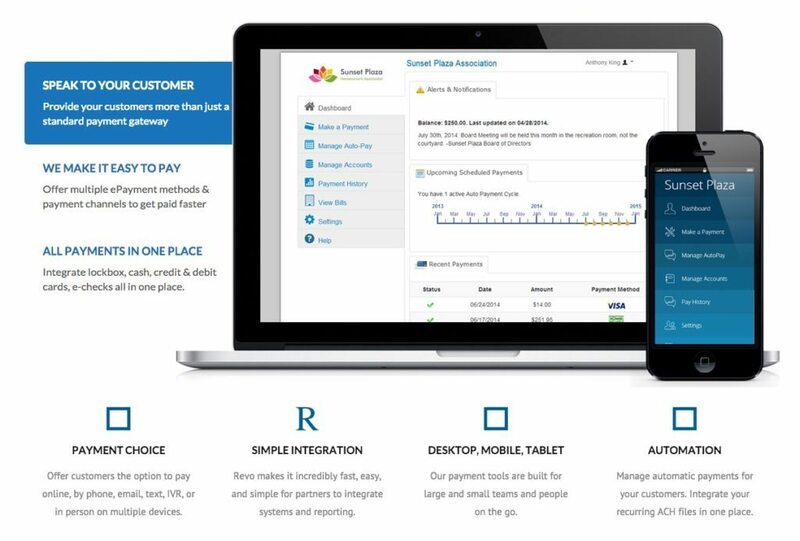 Revo Property Pay, an e-payments solutions company, recently launched a mobile platform for property managers to collect rent and homeowners association (HOA) fees all in one place via smartphone or tablet. Announced July 23, the mobile platform streamlines the process of paying monthly and recurring bills from any device. The payments are transmitted through a secure PCI-compliant network used by more than 5,000 clients throughout the nation. Revo Property Pay is created exclusively for the property management industry and features a user-friendly interface that makes keeping track of transactions and payments simple. Tenants are able to pay via multiple methods and channels, including cash, credit and debit cards, or e-checks. All payments can be found in the platform’s “payment history” portal that can be exported to a CSV file for easy management. A screencap from Revo Pay’s service. Helping to eliminate the paper trail and increase on-time payments from tenants, Revo Property Pay for landlords and property managers is intended to help eliminate late payments and increase return on investment. According to Mike Corbera, CEO of Revo Property Pay, the intention of creating a platform that recognizes what type of device is being used eliminates the need to download an application to each individual’s smartphone or tablet. This Web-based system works seamlessly with whatever type of device is being used. Property managers who are already using a CRM or property management software may be able to integrate right into the platform that is already in use through a simple or custom integration using API access. The platform works with both larger property management organizations and smaller ones. The dashboard functions can be controlled with employee access levels, so only the people who need to see important payment transactions can. Revo Property Pay has 12-hour funding, meaning payments are processed within 12 hours making it one of the fastest turnaround times in the industry. There are no hidden fees for landlords or tenants for payment processes, and communications are automated with emailed receipts and messages.